Yesterday I just had that feeling. If you are a photographer, you know the one. You must go seek out a photo opportunity. I headed to Mount Tabor and set up my tripod and waited. The clouds were dark and grey, but there were a few sun breaks on my drive towards Portland on I-84 from Wood Village, so I was hoping for the best. 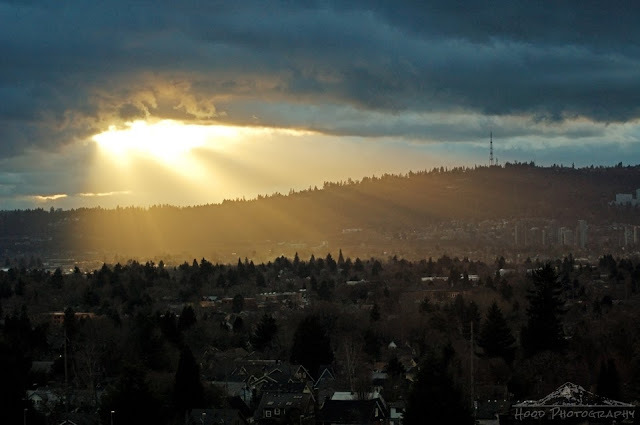 All of a sudden, the clouds broke and these awesome beams shown down on the Rose City. My photographers itch got scratched. Ah ---- not far from where my father grew up. The skies were smiling on you! Lovely capture of the sunlight shining thru to you! Beautiful sky shot! Happy weekend! This sky is really breathtaking! Soooo beautiful! Indeed you did capture an awesome sight. Your itch paid off. Thanks for voting for my photo in the Photo of the Year contest! It sure is a small world sometimes, isn't it? Wow, excellent. Like folding back a blanket! Well done! I know exactly what you mean. Usually it's me scanning the clouds and knowing I MUST get to someplace scenic to take advantage of something good in the light. It can be hard in regular life to get the scenic itch scratched. Lucky you! You're a great photographer, but you must be patient, too! !